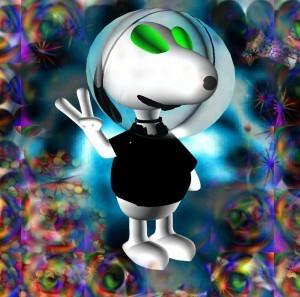 Alien Beagle is the creation of Pat Powell. The first single “Hole In the Moon” was released March 1, 2013 and was immediately put on the 2013 Winter Music Conference Compilation CD garnering much praise. Powell’s style is somewhat akin to “Heavy Metal Blues” within the vein of Progressive/Industrial Rock. Imagine Godzilla vs. a Wall of Marshals! He’s been playing guitar and keyboards since he was nine years old. Powell has studied Jazz, Blues, Rock and R&B guitar styles. Powell also performs solo acoustic shows that can be rather aggressive. Powell is presently based in South Florida. Imagine Godzilla vs. a Wall of Marshals! “Hole In the Moon” was on the 2013 Winter Music Conference Compilation CD.